As the Islamic fasting month of Ramadan approached two thirds of the way through September, Malé International Airport was kept busy with a massive exodus of Maldivians. Flights were jam-packed with travellers heading to destinations such as Colombo, Trivandrum, Bangkok, Singapore, Frankfurt and London. These people were supposedly travelling for urgent medical treatment and clinical rest that would last exactly a month from the beginning of Ramadan. Every now and then, passengers would throw nervous glances at each other because they and the rest of the Maldives knew that the real purpose of their travel was to dodge the Ramadan fast. Less fortunate compatriots were left behind to make do with the odd fish bun for lunch or a packet of instant noodles, half done in lukewarm water poured out of a thermos flask. There was also another exodus passing through the same departure gates at around the same time. 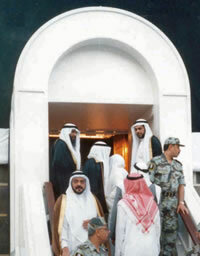 Their destination was Jeddah in the Kingdom of Saudi Arabia. These people were travelling to Mecca to perform the lesser Islamic pilgrimage known as umrah and to spend the fasting month prostrating in worship towards the Kaaba and kissing its Black Stone. The extended proceedings of the greater Islamic pilgrimage known as haj, would include a visit to the jamraat posts in Mina representing Iblis, the Islamic satan. There they would vent their hatred by hurling stones at the posts. The scene would be much like the stoning to death of half-buried women at the orders of the mullahs, without the gory aspect of course. Some over-enthusiastic participants of this ritual would throw their flip-flops and yell abuse directed at the "crusader zionist great satans" the United States and Israel. At destinations such as Heathrow, Changi and Suvarnabhumi, Maldive travellers are usually greeted with a friendly “welcome to Great Britain”, “welcome to Singapore” or “sawadee”. The entry at Jeddah is usually not that friendly. Indeed many Maldive travellers have their passports thrown on the floor and spat on by customs officials for no sensible reason. Foreign missionaries with their local collaborators. The social standing of the passengers or the purpose of their travel does not seem to matter at all. On one occasion a very important Maldive ruling mullah who was indoctrinated in Egypt and Saudi Arabia was locked up in a glass cage at Jeddah airport for hours on end. Admittedly, in that particular instance, the mullah deliberately overlooked to arrange a visa. He claimed that he would be exempt from immigration formalities in any Arab country because of his dedication as a collaborator to the colonialist cause. That was not to be the case for this diminutive individual with a grey beard. The government-designated heads of the annual pilgrimage contingents known as emir el-haj (commander of the pilgrimage) also face more or less the same fate. The fact that they hold letters of introduction from the Maldive authorities and letters of invitation from the custodian of the two shrines and the governor of Mecca seems to be of little consequence. Occasionally they are yelled at, just like any common-o-garden Maldive pilgrim, and have their passports thrown on the floor and spat on. Locals in Malé assembled to listen to foreign missionaries. Many Maldivians now regard it unpatriotic not to ditch the heritage of their grandmothers in order to embrace the colonialist burugaa veil. Until recently there was also another cause for abuse at the hands of Saudi Arab customs officials. Older Maldivians still have traditional Divehi names. This in spite of Maldvians being forced to take Arabic or Arabic-sounding names for years by the ruling mullahs. To the great chagrin of the fascists a few people still remain, who have Divehi language names. One such person, a well-known sports personality in his youth, was yelled at and had his passport thrown on the floor and spat on at Jeddah airport. His only crime was having the insubordinate audacity to enter the Kingdom of Saudi Arabia as a pilgrim using his own name. He was accused of being an infidel attempting to defile holy sites that are strictly out of bounds to najis (unclean) sub-humans. Saudi Arabia operates an apartheid-like system in which najis infidels are segregated away from certain locations and have to keep to certain roads. The reaction of customs officials at Jeddah to the Maldive pilgrim who had an indigenous name was the result of this discriminatory policy. Following this incident Maldive authorities have strictly prohibited the few remaining Maldivians who have native Divehi names from using their real names in their passports. These people are assigned colonialist "Islamic" names that they had never used in their lives. To compound this insult, Maldivians travelling to the Islamic pilgrimages now have to have three Arabic names in order to conform to the Arab naming convention. Any deviation from this is not tolerated by, what I call, the Maldive name Nazis. We are now in phase two of the transformation process. In phase one, indigenous names were forcibly wiped out. In phase two, any hint of deviation from colonislist norms are being outlawed. Some of today’s ruling mullahs themselves had their already-Islamic names adjusted to colonialist conventions when they were students in medrassas in the Middle East. A certain Abdulla Maumoon was renamed Maumoon Abdul Gayoom; Mohamed Zahir was renamed Mohamed Zahir Hussain; Mohamed Rasheed adopted the name Mohamed Rasheed Ibrahim and Fathulla Jameel aquired the name Fathulla Gamil Abdulla. The latter reverted to his old name later. 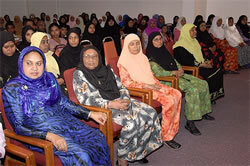 These are yet other examples of the Maldive mullahs pandering to the dictates of their colonialist masters. Many Muslims enjoyed a better lifestyle in non-Muslim Britain than they did in Muslim Saudi Arabia. At that moment I longed to be home again. Out of respect for local custom, she wore the long black abaya and covered her hair in a black scarf. In all the years I had known my wife, never had I seen her appear so dull. Yet on two occasions she was accosted by passing Saudi youths from their cars. On another occasion a man pulled up beside our car and offered her his phone number. My time in Saudi Arabia bolstered my conviction that an austere form of Islam (Wahhabism) married to a politicised Islam (Islamism) is wreaking havoc in the world. This anger-ridden ideology, an ideology I once advocated, is not only a threat to Islam and Muslims, but to the entire civilised world."